Etawah is a fast growing town in the district and also a major shopping hub in the region. People from different parts of the district come here for an exhilarating shopping experience. Ranging from items of daily need to branded apparels and from latest range of mobile phones to trendy exquisite gift items and expensive jewelleries – all are found in the stores and showrooms of Etawah. Electronic machines and devices are also not an exception to this endless list of items sold at the shops of Etawah. All types of electrical gadgets and electronic accessories such LED television, LCD television, refrigerator, washing machine and microwave oven are available at the electronic showrooms of Etawah. Recently-launched electronic devices and machines marketed by the top manufacturers across the country as well as from the international market are displayed exhaustively at the electronic shops of Etawah. 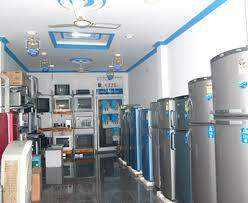 Air-conditioners from leading international as well as best Indian brands such as Voltas, LG, Carrier, Whirlpool and Blue Star are sold at the electronic showrooms of Etawah.